OYO Flagship 15228 in H Block, South City 2, Gurgaon, is a charming and vibrant property with well-decorated interiors. It is close to Mayfield Garden, Grand Cinemas, and not far from Guru Nanak Park. 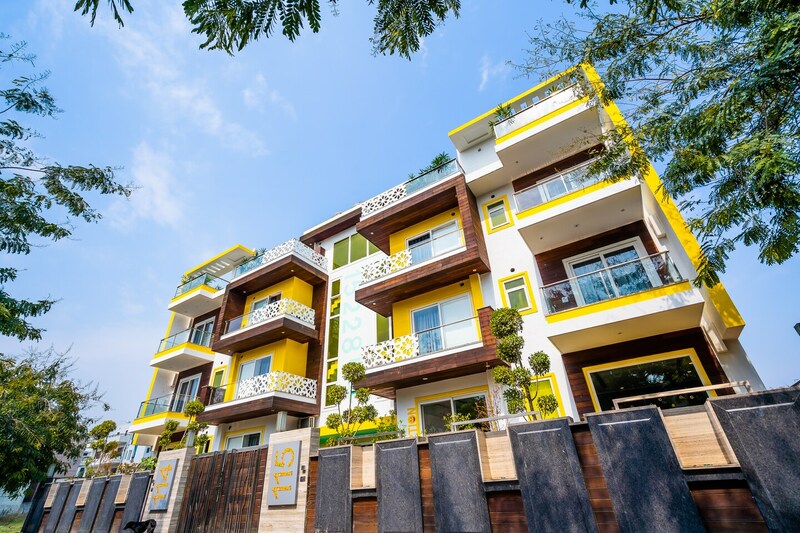 The property has a bright yellow and modern exterior and multiple balconies. The reception and lobby loungee are spacious, receive lots of sunlight and colourful. The common living space has a bright red sofa and funky shelves for books. The dining space has sea green walls and trendy furniture. The onsite restaurant is stylishly furnished, spacious and has a trendy lighting system. There is a relaxation nook with cane swings and funky wall art. The rooftop is also colourful and feature lush potted greens. All rooms have bright feature walls with quirky decals and there are round pillows on the beds, with emoticon motifs. All rooms have large glass sliding doors leading to balconies. Each room here comes with AC, TV, and the property offers free internet, an elevator, CCTV security, power backup, card payment, and laundry services too. There are plenty of eateries nearby, like The Ancient Barbeque, The Kylin Experience, Tpot, BBQ Joint, and 0124 Bar Exchange - Open Terrace Brewery.